About halfway through the film trailer a maestro of Toronto’s samba music scene hoists one arm and hops around in a spirited attempt to get members of his band moving. A woman in the front line is already bobbing from side to side. She’s from Brazil. She doesn’t need much encouragement. The others are not from Brazil. They remain frozen for a moment before, one by one, shaking off their stiffness. It doesn’t look like they’re contributing much to the groove the band is trying to create. But according to Natasha Pravaz, looks are deceiving. 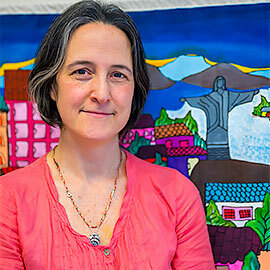 Pravaz, associate professor and coordinator of Laurier’s Anthropology program, has been studying Brazilian culture, samba music and its relationship to the body for over two decades. She was born in Argentina, but raised in Brazil before moving back to Buenos Aires as a teenager. For years she pined for Brazilian culture – especially samba music. Fast forward about a decade and Pravaz, studying for her PhD in Toronto, was standing on College Street when she heard familiar rhythms in the distance. They drifted from a samba band grooving along the avenue. Immediately, she followed the sound. Eventually, she picked up a tamborim (drum) and joined the band. Each rehearsal and performance is a cultural exchange. Canadian-born samba fans participate in the joy of music-making and moving their bodies. Some get a quasi-religious, trance-like experience. “For some people it has that utopian quality,” Pravaz said. For migrants who miss their homeland, their samba bandmates can be a substitute family. For Pravaz, playing in the band is a way of living the culture she loves. But it’s also the way anthropologists conduct academic research, she said. After years of researching and writing about Brazilian culture, Pravaz found that pounding out her observations on a keyboard was inadequate. “I couldn’t quite convey the excitement and joy of playing together,” she said. She also wanted to put the spotlight on her bandmates in the Batucada Carioca samba ensemble. So from 2008-2010 she made videos of interviews with the maestro (Maninho Costa), rehearsals and performances, then assembled the clips into her film Sound of the Drum and the Maestro. “I believe this represents them in a medium that does them more justice,” Pravaz said. But the film isn’t a substitute for writing an academic journal article, she added. For a scholar who wasn’t a filmmaker, spending time in an editing room was risky because it sucked up time that Pravaz could have spent researching, writing and getting articles published in peer-reviewed journals — valuable currency in the academic world. Making the film was a labour of love. But after screening it recently at a Brazilian culture festival in Toronto, knowledgeable friends and colleagues told Pravaz that the film is indeed a scholarly work of anthropology.